Professor Ncoza Dlova has been seconded to the position of Dean and Head of UKZN’s School of Clinical Medicine for a two year period. Dlova has enjoyed a successful career as Chief Specialist and Head of Dermatology at UKZN. In her two years as the first Black African Head of Department and Professor of Dermatology, she has achieved phenomenal successes owing to her passion and drive for excellence with her main areas of research being in the areas of dermatology, ethnic skin and hair diseases, pigmentation disorders and HIV and AIDS. Dlova initiated several successful campaigns which have been recognised locally by the KwaZulu-Natal (KZN) Department of Health, and the National South African Dermatology Society, and also internationally. Notable successes include fundraising R450 000 to refurbish the Skin Clinic at King Edward VIII Hospital in Durban; introducing a WhatsApp consulting service between dermatologists in regional hospitals and medical doctors in rural hospitals thus reducing hospital referrals and patient transfers; driving a national Anti-Skin Bleaching campaign on the streets of Durban in partnership with the Department of Health in KZN, and establishing a dermatological surgery programme to provide training in dermatological surgery allowing specialists to offer a more comprehensive service to skin cancer patients and relieve some of the burdens on plastic surgeons. The dermatological surgery programme was developed in partnership with the Harvard Medical School in the United States and Blade and Light – a US-based organisation involved in global dermatology training. Dlova is also the elected Africa dermatologist on the International Board of Unilever USA and has collaborated on the organisation’s community outreach initiative Direct Relief to provide continued medical education to healthcare professionals through a R1 million grant to improve the management of skin conditions in KZN and the Eastern Cape. She has trained more than 25 African dermatologists since she qualified as the first Black African dermatologist in KZN and is a C1 NRF-rated researcher with more than 60 peer-reviewed publications. She has also written three books and 15 book chapters and co-supervised a large number of PhD and masters students. 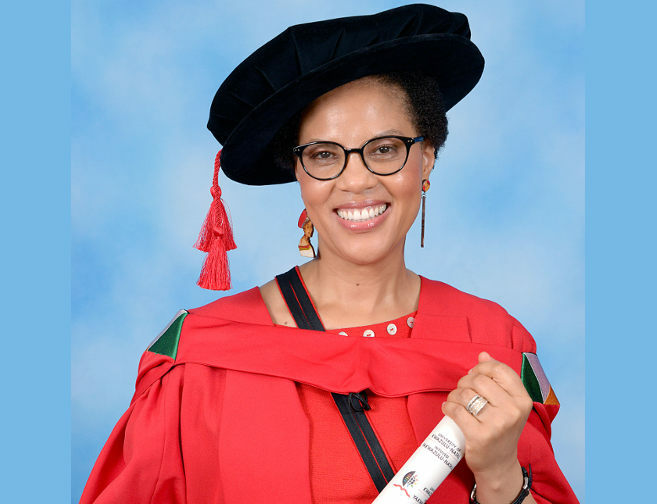 ‘Her phenomenal contribution to the global growth of African Dermatology cannot be overemphasized,’ said Deputy Vice-Chancellor and Head of the College of Health Sciences, Professor Busisiwe Ncama.